Heat the oven to 400°F. Spray 6 (2 1/2-inch) muffin-pan cups with vegetable cooking spray. Sprinkle the flour on the work surface. Unfold the pastry sheet on the work surface. Roll the pastry sheet into a 12 x 10-inch rectangle. With the long side facing you, spread the pineapple topping on the pastry to within 1/2 inch of the edge. Sprinkle with the coconut and macadamia nuts. Starting at the long side, roll up like a jelly roll. Press the seam to seal. Cut the pastry roll into 6 (2-inch) pieces. Place the pastries, cut-side up, into the muffin-pan cups. Bake for 25 minutes or until the pastries are golden brown. Remove the pan from the oven and immediately place a wire rack upside-down on top of the pan. Invert the pastries onto the wire rack and let cool for 10 minutes. 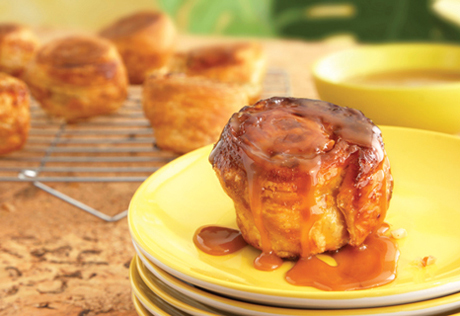 Drizzle each pastry with 1 teaspoon caramel topping. When inverting the pastries, make sure to use oven mitts and hold the pan and the wire rack together firmly. If your muffin pan has 12 cups rather than 6, place the pastries into the center cups and fill the empty outer cups halfway full with water. Bake as directed above. After baking immediately remove the pastries from the pan using tongs and let cool on a wire rack.